Eagle-Vail’s Mikaela Shiffrin came from behind to tie Austria’s Anna Fenninger for the American’s first-ever victory in a World Cup giant slalom Saturday in Soelden, Austria. 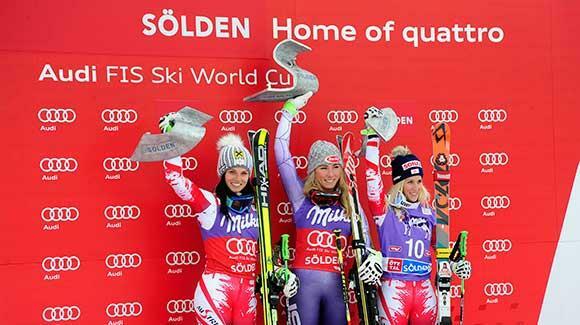 Mikaela Shiffrin celebrates her win in Soelden Saturday (US Ski Team photo). Shiffrin held a narrow .09-second margin over Fenninger heading into the second run, then came from behind after losing ground mid-course, scorching the bottom flats in the second run to tie Fenninger for the win. Austria’s Eva-Maria Brem was third. A nine-time World Cup slalom winner, Shiffrin celebrated the 100-day mark to the World Championships in her hometown of Vail/Beaver Creek by winning her first ever World Cup GS – the 10th victory of her young career. Shiffrin was fifth in GS earlier this year at the Sochi Winter Olympics and was sixth last season at Soelden, but has never broken through with a win in the discipline. Shiffrin became the fourth American to win in Soelden since the opener began in 1993. Vail’s Lindsey Vonn won in 2011, Park City’s Ted Ligety has won the last three years and hopes to make it a four-peat when the men open their season Sunday, and Bode Miller won in 2003 and 2004. In both runs, Shiffrin’s bottom section was the turning point. In the second run she gave up ground through the steep section of the course, but gained it back on the flat lower section of the run heading into the finish. Julia Mancuso, of Squaw Valley, Calif., shook off a 47th starting slot to move up dramatically, finishing 17th. The finish boosted her to 31st in the World Cup Start List as she seeks to regain a top seed position. The women head back to Colorado for training at the U.S. Ski Team Speed Center at Copper Mountain, while the men will run their GS on Sunday.